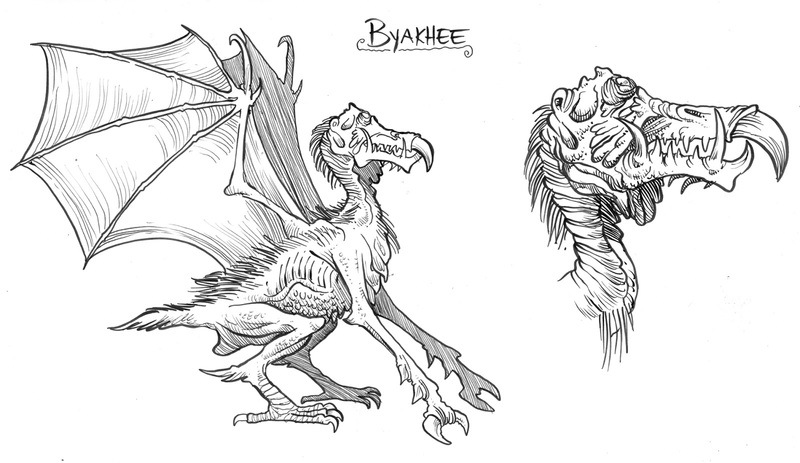 Among the many creatures dreamt up by author H P Lovecraft we find the Byakhee, which is probably one of his weirdest. 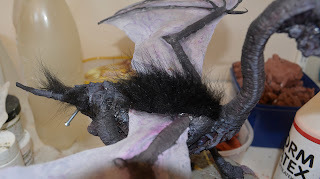 In his short story "The Festival" they appear as mounts for a strange secret sect, and are described as hybrids with features from such diverse things as bats, moles, birds and decomposing humans. One of Lovecraft's protégés August Derleth also wrote about Byakhees in his story "The Gable Window", but his version of the monster is easier to grasp. 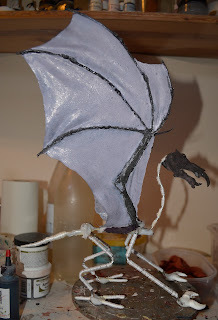 I'm building a Byakhee puppet for my video version of Lin Carter's poem "The King In Tatters", and his version of the beast is something in between Lovecraft and Derleth. 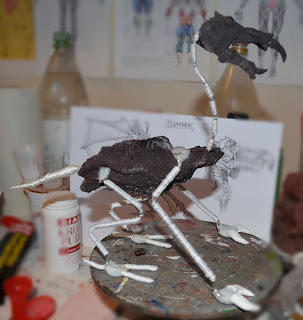 The sketch above is my concept of the Carter Byakhee, and my guide for the puppet. 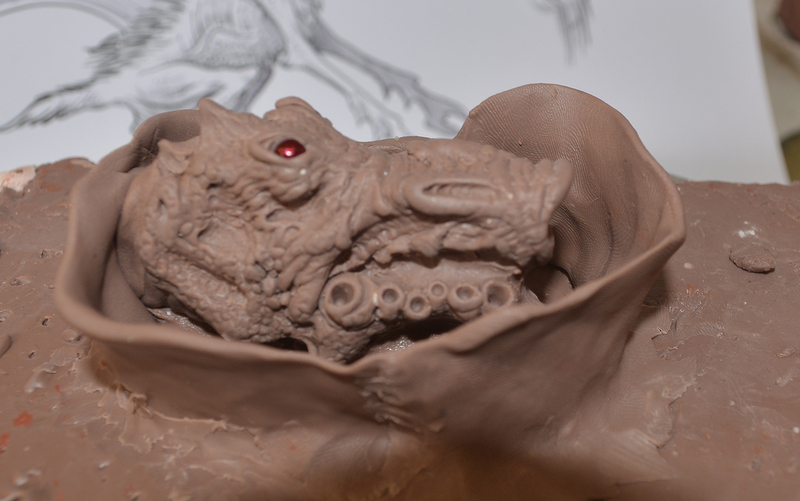 Medium grade Monster Clay was my material of choice for creating the head. 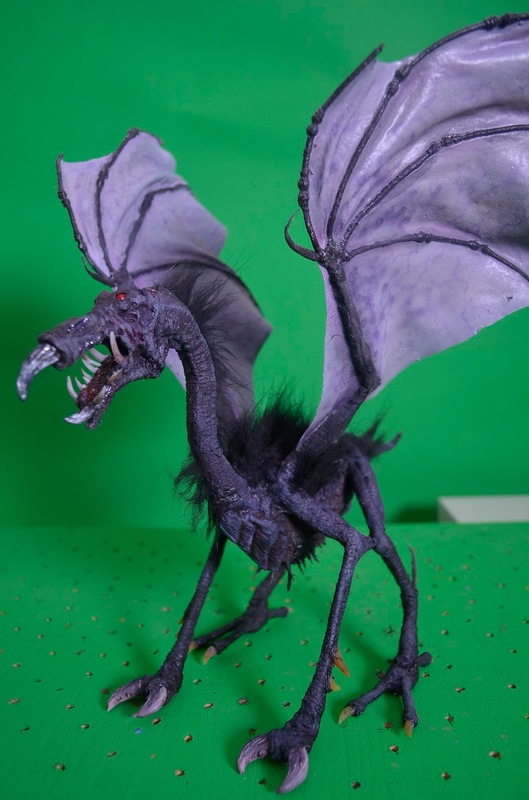 "Black-furred and iron-beaked, with eyes of Hell" is how Carter describes it. I tried to get something that looked loathsome and I took familiar features and did something different with them. Therefore I, for example, put the eyes on the topside of the head, like a bottom-dwelling fish. The head was mostly sculpted with tiny loop tools. 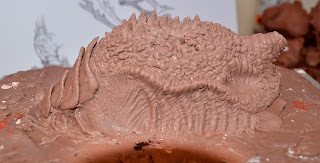 The head is cast in a one-piece mold, with the mouth cavity filled up with clay. 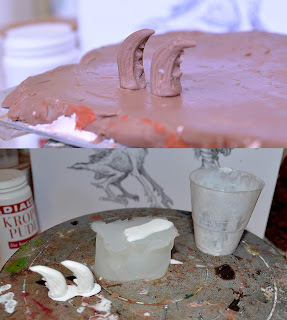 I try to make most of my molds in one piece. 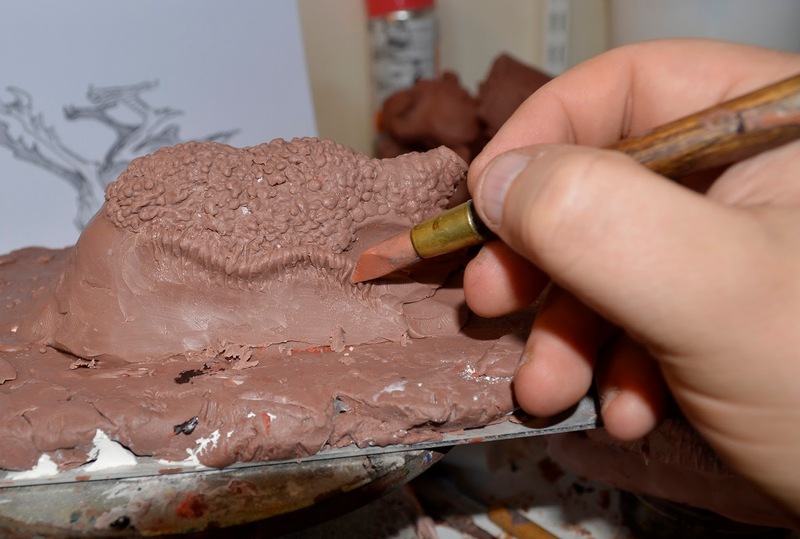 A clay wall is built up around it to hold the plaster around the sculpture. 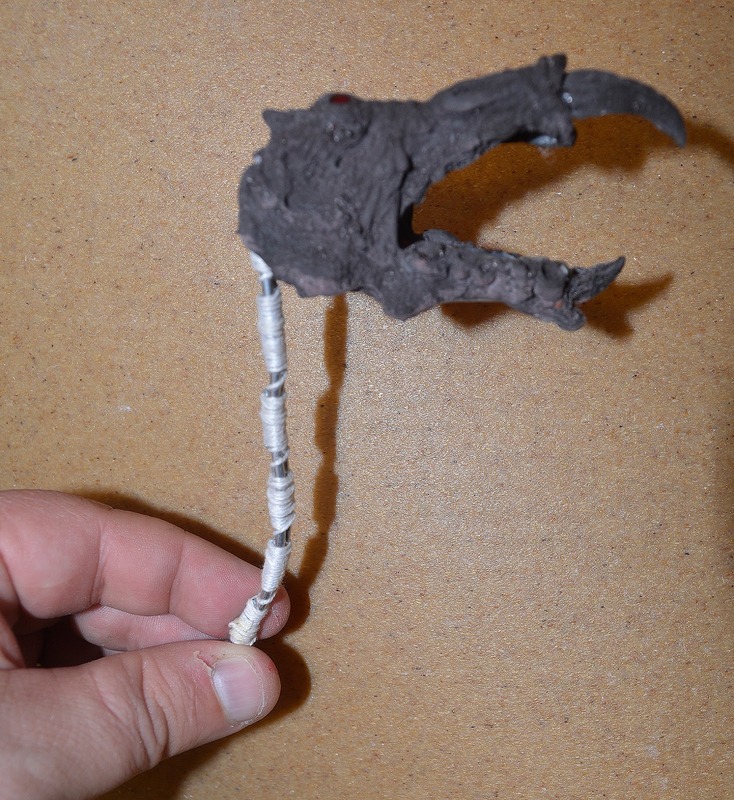 Can't remember what the small cast is, but the bigger one is the Byakhee head. I'm using pink dental stone, which creates very durable molds, and which are also easy to cast latex into. 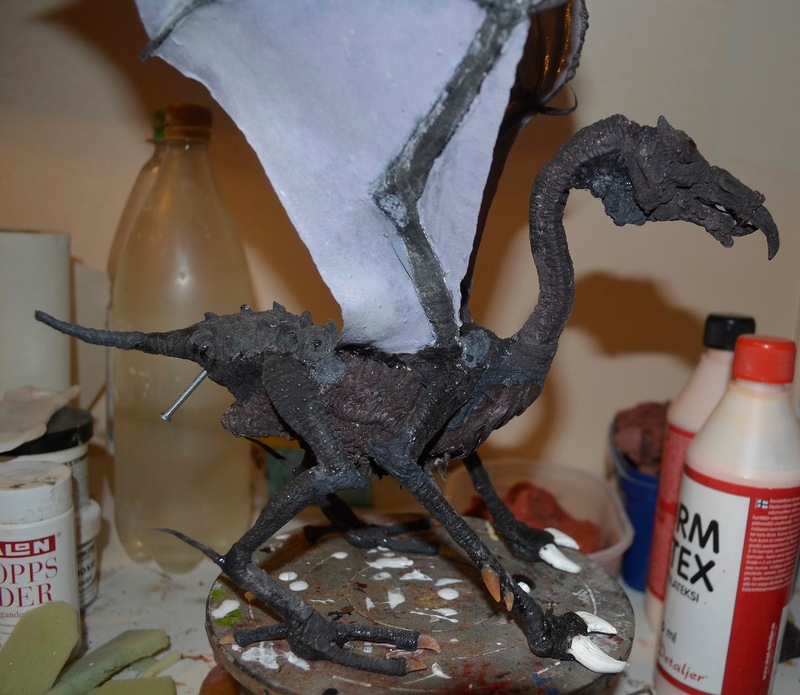 The other body part I sculpted was the underside of the body. Again I'm using Monster Clay medium grade, and various sculpting tools, among them a rubber-tipped tool. 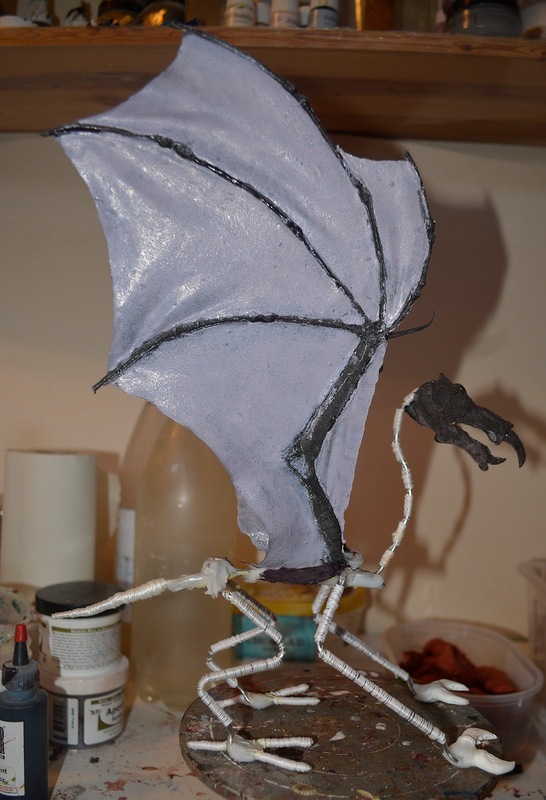 My aim with this sculpture was to create an amalgam of different textures, making the body look like it's a hybrid of very different creatures. The sculpture is actually upside down. The warty spiky "back" will be the monster's gut. 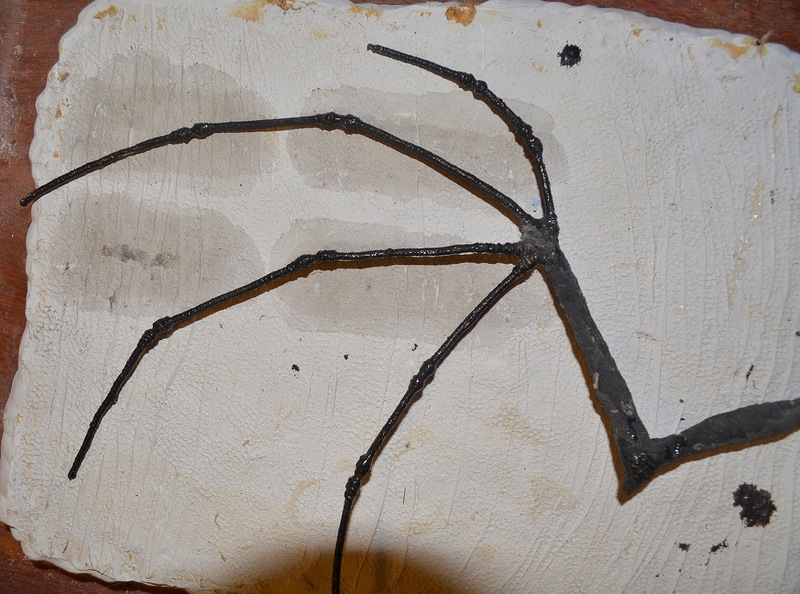 The head has been cast in black-tinted latex, and attached to an aluminum wire armature using Friendly Plastic thermoplastic. 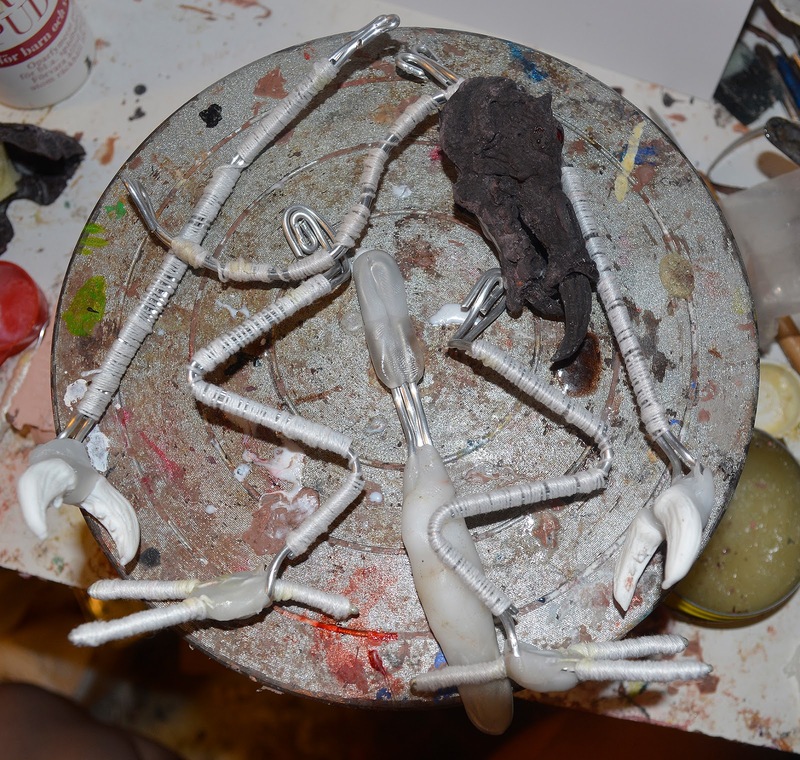 Two reflective read beads are inserted into the latex skin and attached by pressing the soft plastic up behind them, until they stick as the plastic cools. 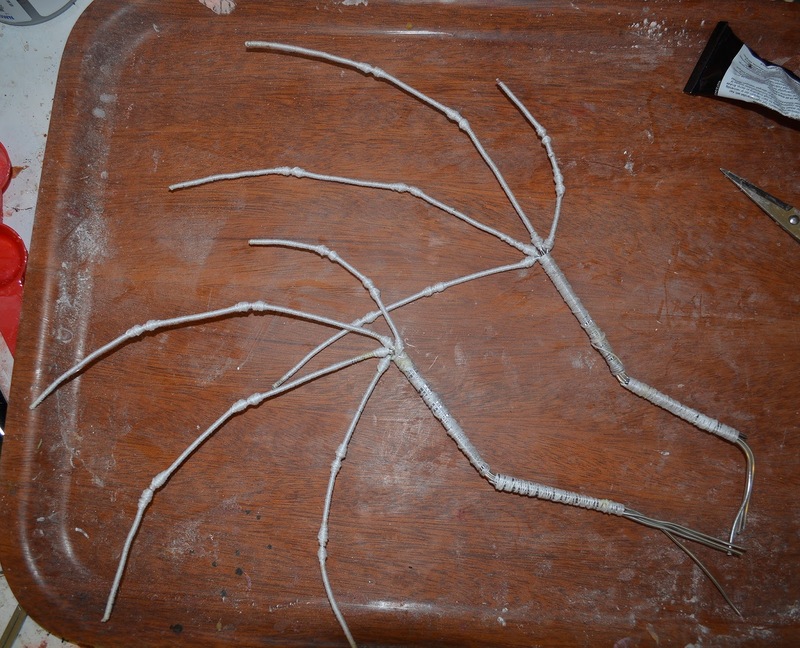 The neck, a length of folded aluminum wire, is divided up in small sections using short steel nails as "vertebrae" held in place with crochet yarn. 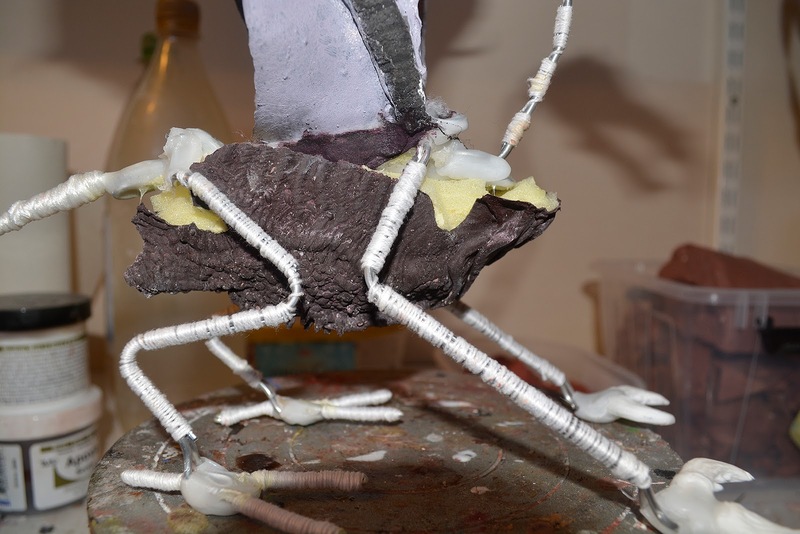 To get the insect element into the Byakhee physique I'm making its front legs look like the limbs of an ant. 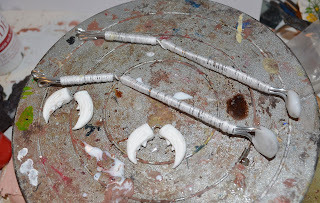 I'm sure I could've made the claws in some very simple way, but decided to sculpt them and cast them in plastic using silicone molds. 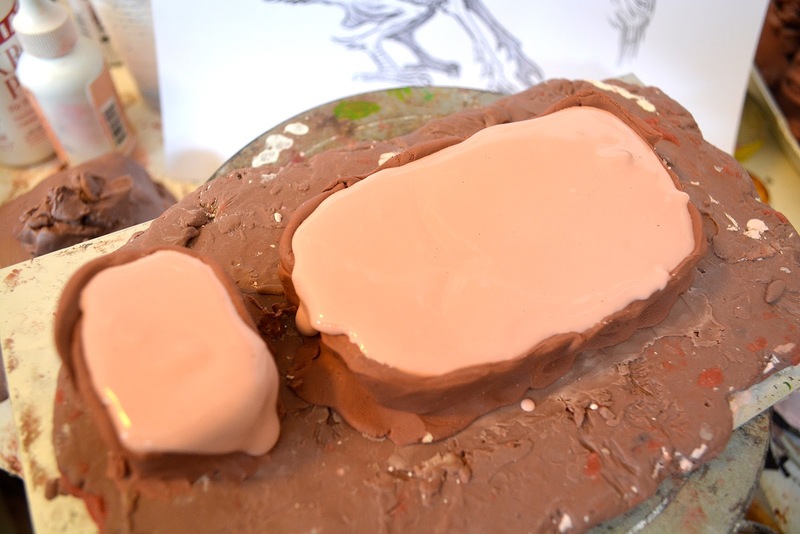 Here's the body sculpt cast in tinted latex and filled with layers of soft polyurethane foam. The ant-like forelegs with the plastic claws waiting to be attached. 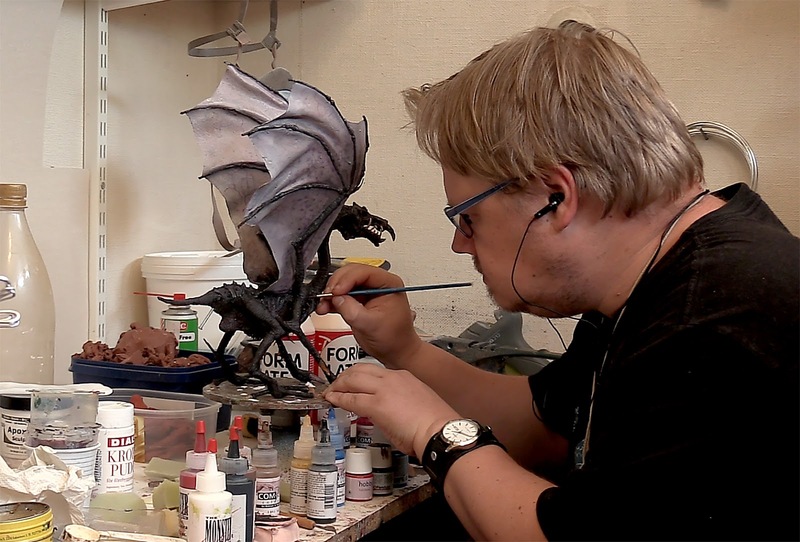 Friendly plastic holds them in place. 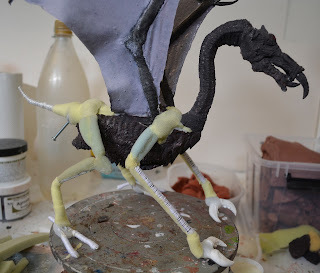 The various bits that make up the Byakhee puppet, including the spine. All feet have wing nuts in them to hold tie-down screws. 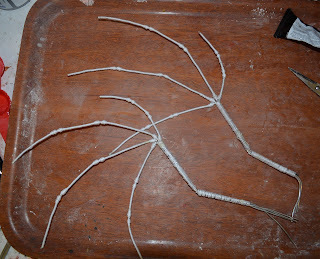 All the limbs, including a stumpy tail are joined with Friendly Plastic. 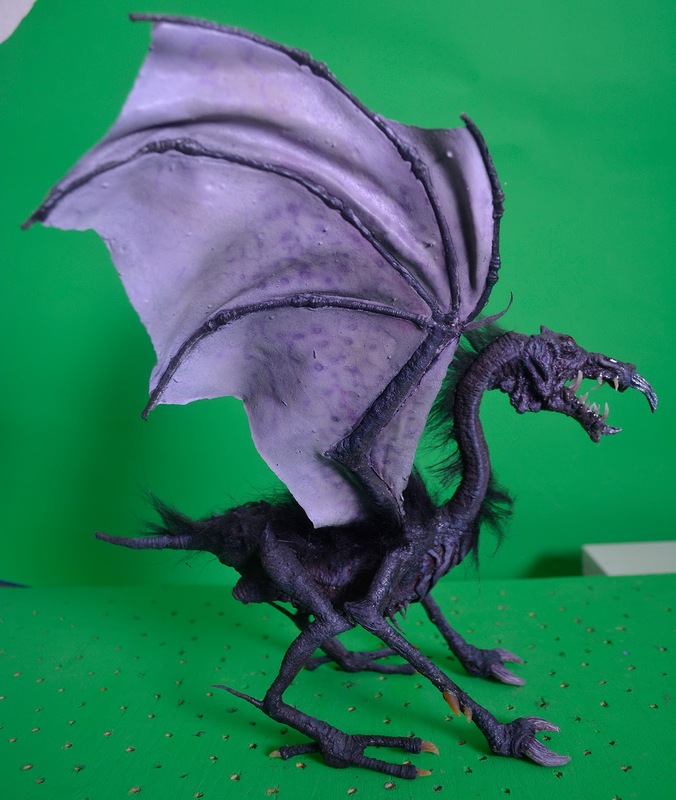 I did attach the belly here, but pulled it off and filled it up with more foam to make it saggier. I've covered wing-making in quite a few of my earlier blog posts, so I'll just rush through the process here. 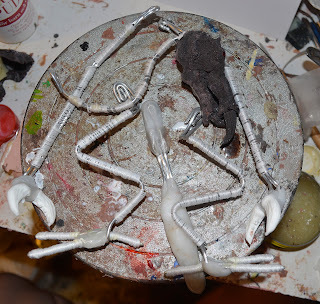 Aluminum wire frames are wrapped in soft string..
And a combination of cotton mixed with latex and polyurethane foam is used to build up muscle shapes. 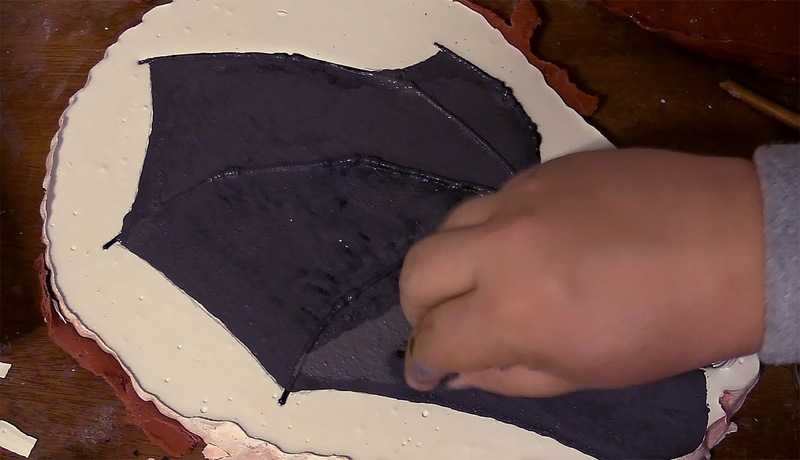 Patches of latex skin are cast in old plaster texture molds and used to cover the muscle build-ups. 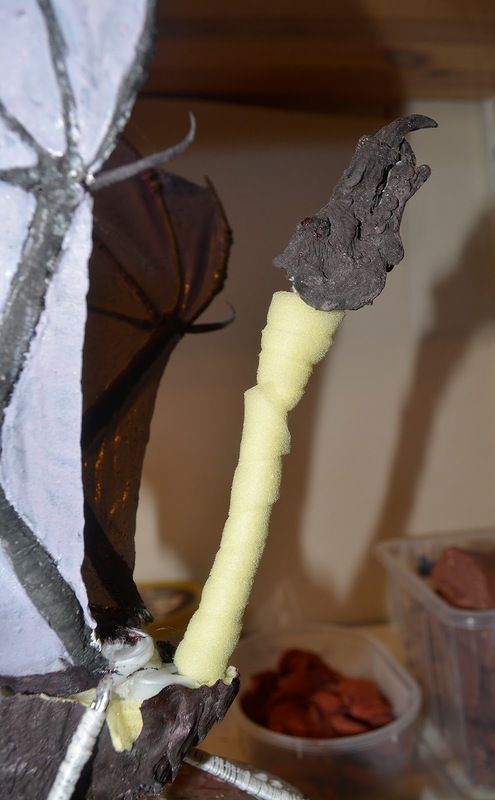 Here's the skin-covered arm bit of the wings, and the "fingers" have also been covered with tinted liquid latex. The wing membranes are created by submerging the wing halfway down into cheap hobby plaster and when the plaster has set I can sponge on latex between the fingers. When that has dried I just pull the wing out of the plaster. I made the wing membranes a little too dark, so I have painted them with a mix of latex and pigments. 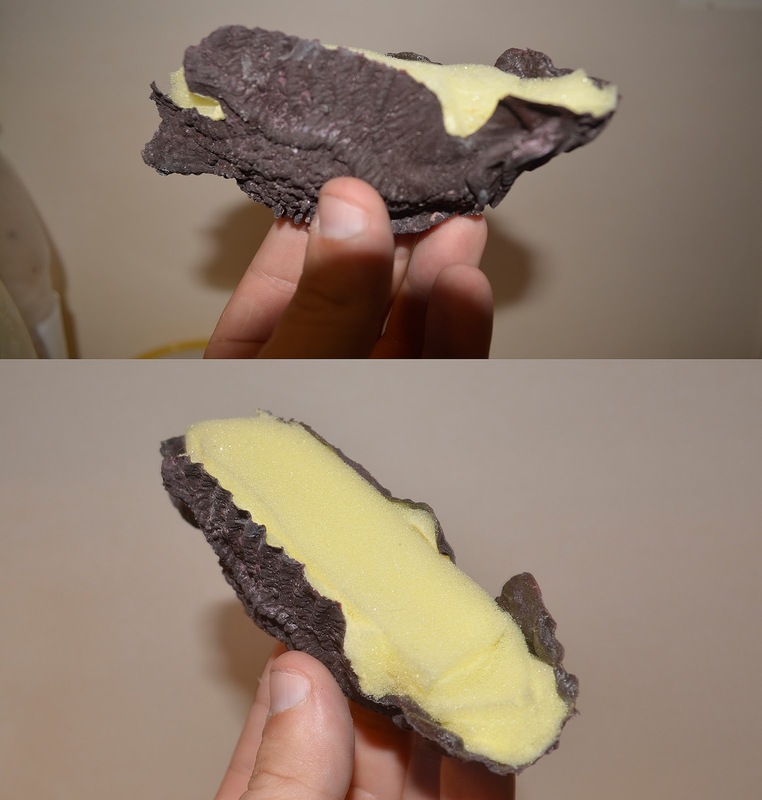 And as you can see the belly is now removed. Filling up the belly piece with more foam made the creature look bloated and slightly clumsy when compared to the skinny legs. 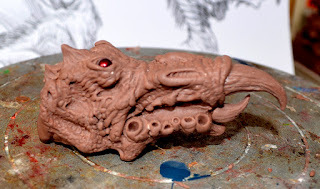 Time to build up some bulk on the critter. I'm using a thin polyurethane foam which is manufactured to be placed under plate racks in kitchens to soak up moisture. I'm simply wrapping some of it around the neck. 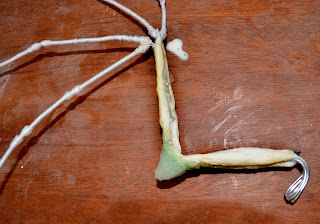 The rest of the body and the limbs get a more careful build-up of foam muscle padding. Soft yarn is also used to create certain shapes. 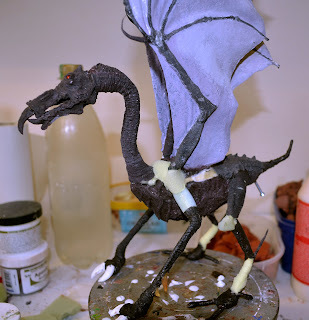 Again, patches of tinted latex skin cast in various texture plaster molds I've made over the years are used to cover up the puppet body. Here's the finished skin patching job. 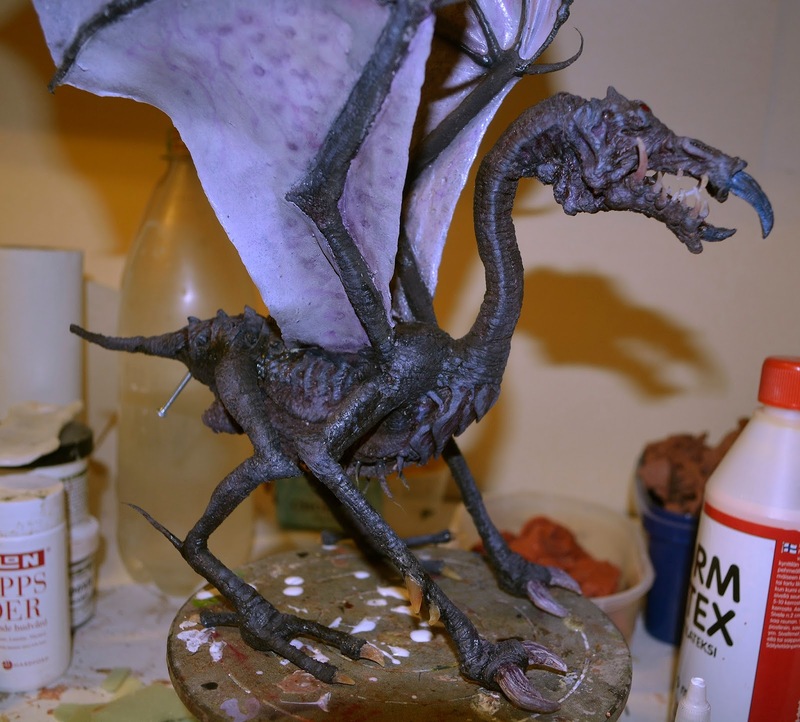 I used my Iwata airbrush to create a subtle mottling on the wings, but I then simply painted on the acrylic airbrush paints with a small brush. 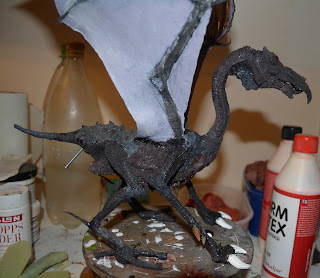 I'm almost done with the puppet, but it's supposed to be black-furred, remember? This fur is actually brown and comes from an old lady's hat bought at a thrift store. 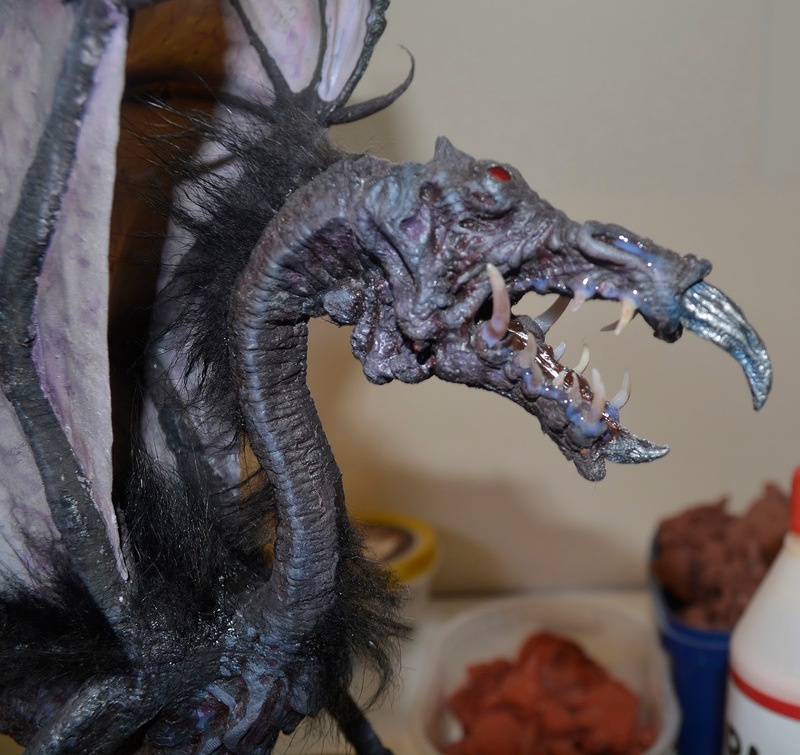 I cut strips of the fur and painted it black with the acrylic airbrush paints. 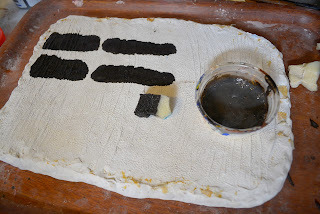 This also created a stability in the hairs and made them keep their shape. 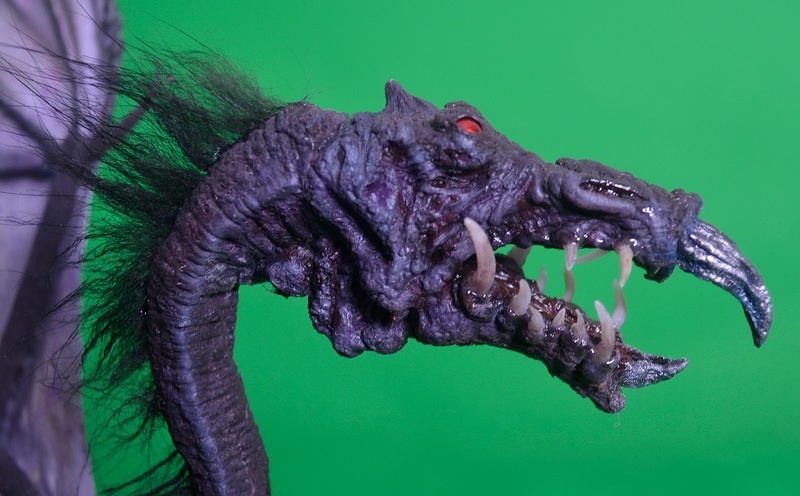 Tufts of hair are attached using Prosaide prosthetic glue. The teeth are blobs of melted Friendly Plastic simply rolled between my fingers into pointy elongated shapes. 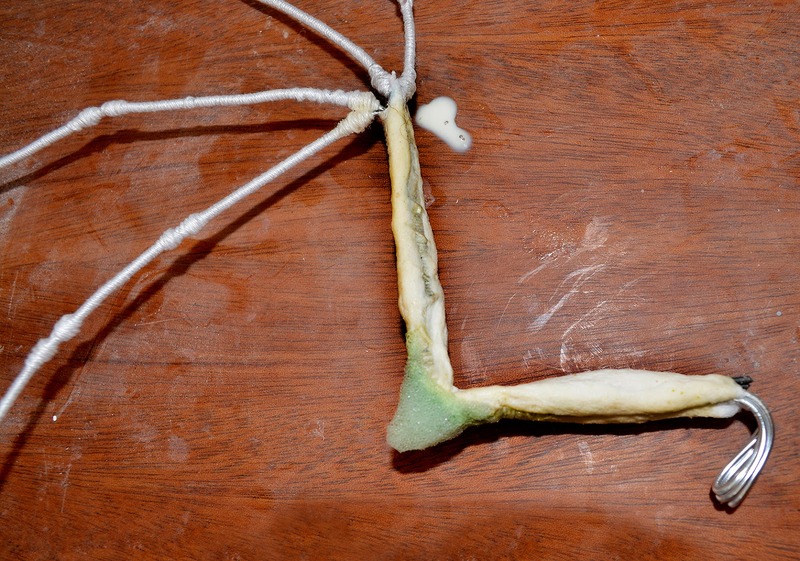 Flexible super glue is used to attach the teeth into the gums of the latex head. Glossy Accents scrapbooking plastic is smeared around the mouth and in the nostrils to create shiny, moist areas. The finished Byahkee is ready to be animated. To keep it aloft while it's flying I'm attaching it to a flying rig from Animation Toolkit using a wing nut at the rear end of the puppet. 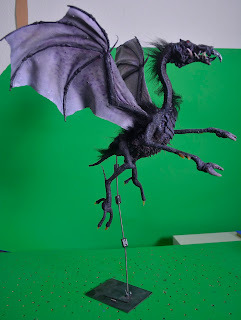 Hopefully, the finished scenes in the film will look something like this. 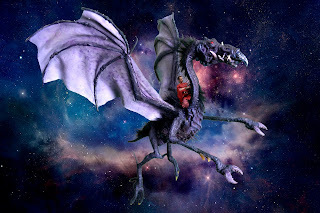 This image is a Photoshop mash-up, with an image of the film's actor Samuel Lange riding the Byakhee as they head for Carcosa on cosmic winds.